What you can learn from having a 10% or 25% tariff slapped on your products. Ben Bidwell is the Director of U.S. Customs for C.H. Robinson (www.chrobinson.com). He joined C.H. Robinson in 2004 and became a Licensed Customs House Broker in 2007. Mr. Bidwell has consulted and resolved a wide range of customs disputes for clients involving classification, country of origin, marking violations, seizures, and protests, and for products ranging from hospitality goods, automobile tires, apparel and textiles, toys, and other consumer retail goods. He can be reached at solutions@chrobinson.com. The other day, a client called and said, “I’m going to change the classification on my product so I don’t have to pay tariffs.” I told him I don’t recommend it. For those facing new tariffs, it may be wise to consider reinventing your approach to your compliance strategy by reevaluating your supply chain and considering how you can reduce your risk. List 1 tariffs on $34 billion of Chinese products went into effect on July 6. List 3 tariffs on $200 billion of Chinese goods: the 10% duty effective on List 3 products went into effect on September 24, 2018; the 25% duty effective on List 3 product was initially intended to go into effect on January 1, 2019. However, on December 2, 2018, U.S. and China leaders met at the G-20 summit and agreed to a 90-day hold on the List 3 increase for January 1. 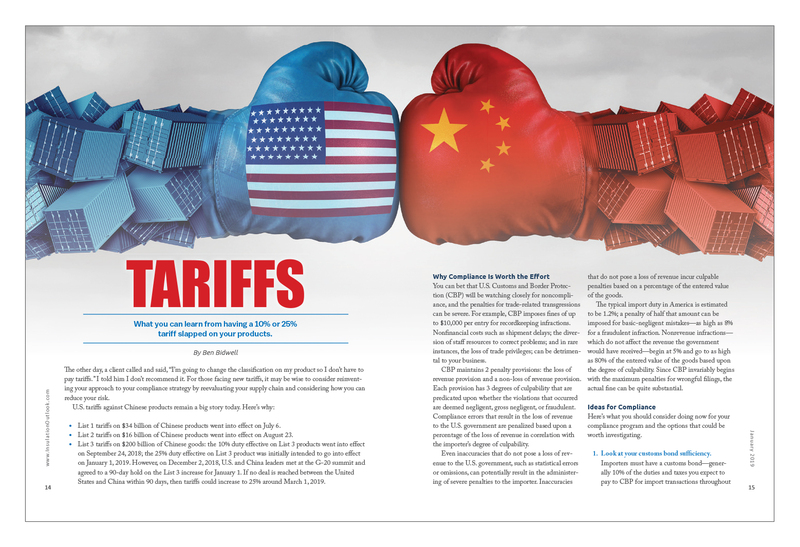 If no deal is reached between the United States and China within 90 days, then tariffs could increase to 25% around March 1, 2019. You can bet that U.S. Customs and Border Protection (CBP) will be watching closely for noncompliance, and the penalties for trade-related transgressions can be severe. For example, CBP imposes fines of up to $10,000 per entry for recordkeeping infractions. Nonfinancial costs such as shipment delays; the diversion of staff resources to correct problems; and in rare instances, the loss of trade privileges; can be detrimental to your business. CBP maintains 2 penalty provisions: the loss of revenue provision and a non-loss of revenue provision. Each provision has 3 degrees of culpability that are predicated upon whether the violations that occurred are deemed negligent, gross negligent, or fraudulent. Compliance errors that result in the loss of revenue to the U.S. government are penalized based upon a percentage of the loss of revenue in correlation with the importer’s degree of culpability. Even inaccuracies that do not pose a loss of revenue to the U.S. government, such as statistical errors or omissions, can potentially result in the administering of severe penalties to the importer. Inaccuracies that do not pose a loss of revenue incur culpable penalties based on a percentage of the entered value of the goods. The typical import duty in America is estimated to be 1.2%; a penalty of half that amount can be imposed for basic-negligent mistakes—as high as 8% for a fraudulent infraction. Nonrevenue infractions—which do not affect the revenue the government would have received—begin at 5% and go to as high as 80% of the entered value of the goods based upon the degree of culpability. Since CBP invariably begins with the maximum penalties for wrongful filings, the actual fine can be quite substantial. Here’s what you should consider doing now for your compliance program and the options that could be worth investigating. 1. Look at your customs bond sufficiency. Importers must have a customs bond—generally 10% of the duties and taxes you expect to pay to CBP for import transactions throughout the year. Customs can shut down all imports if they discover you have an insufficient customs bond. Since tariffs (and duties) are increasing substantially, your bond may no longer be sufficient. Bond insufficiency will negatively impact your ability to conduct business, and will lead to additional costs and delays if not monitored or addressed in a timely manner. Even if you don’t require a new bond now, consider the increased duty amounts well before the bond renewal period comes up. If your bond will need to be significantly higher, the surety company may require additional documentation—including financial statements and possibly letters of credit—before they issue a new customs bond, all of which will take time to get into place. 2. Take advantage of duty drawback programs. Duty drawback programs refund 99% of certain import duties, taxes, and fees for goods that are subsequently exported; this supports both U.S. manufacturing and foreign export sales. Previous duties might only have been in the 1% to 2% range, and since there is paperwork to file to get the refund, many companies did not bother with it. Today, those 1.2% duties have jumped up to 25%, and duty drawback programs could be a game changer for your business. The downside: you have to pay the duties up front, then wait for 1 to 2 years to receive the refund under the current drawback environment, which can become a cash flow issue for some companies (typically, it takes 4 to 6 weeks for a claimant to get paid under the Accelerated Payment program, but until the Drawback Modernization regulations are finalized, Accelerated Payment is suspended). 3. Use free trade zones (FTZs). FTZs are secure areas located in or near CBP ports of entry under CBP supervision. Unlike duty drawback programs, you don’t have to pay duties when goods enter an FTZ. Instead, FTZs enable duty deferment; the duties are paid when the goods enter CBP territory for domestic consumption. At that point, the importer pays the duties at the rate of either the original foreign materials or the finished product (of course, with Section 301, you would still have to pay the 25% tariff from China when the cargo enters into the zone under Privileged Foreign Status). 4. File for exclusion requests. If you think your product should be excluded from U.S. tariffs, you can request exclusion. However, be aware this is a painfully slow process at the moment. For example, after the steel and aluminum tariffs on List 1 went into effect, thousands of companies requested exclusions. So far, the Bureau of Industry and Security has approved a small number of exclusions for steel and aluminum; no exclusions have been approved by the U.S. Trade Representative for Section 301 China on List 1 or 2 yet. The U.S. Commerce Department hired 30 people to handle the exclusion requests, however, it will take them time to learn the ropes and process those requests, much less any future exclusion requests. The deadline for submission of List 1 exclusions is October 9; the deadline for List 2 exclusions is December 18. When filing an exclusion, make certain that the classification you are using is the best classification for your product. Also, work with a trade attorney who can help you navigate the law and apply it to your specific product so your exclusion isn’t rejected on a technicality. 5. Consider changing sourcing locations from China to another country. It’s not always easy to change suppliers, but such are the times we live in that some companies are looking at it. Be aware that suppliers for some materials are only found in China, and even if you locate a source in another country, there can be issues. Can they supply at the level you need? How long will it take to test the new supplier to ensure they can meet your specs? The more complicated your product, the more challenging this process of switching will be. Also, keep in mind that you can’t just change the shipping location. If the cargo ships from Singapore but its origin is China, Section 301 tariffs still apply. 6. Take advantage of Section 321. Low value entries that have a value of less than $800 are not subject to duties. That doesn’t mean you can break up your shipments to be less than $800 in value. But for certain companies that ship directly to consumers from overseas, this may be a viable option. 7. Consider the impact of your product. Go back and review the basics of your supply chain. For instance, imagine that you are an importer of lunch bag coolers. There is a big difference in duties for lunch bag coolers that are all soft sided versus those that have a plastic coating. In that instance, the company could plan to import fewer high-duty bags. Likewise, there is a big difference in duties for a T-shirt that is 55% cotton/45% polyester versus a T-shirt that is 45% cotton/55% polyester. 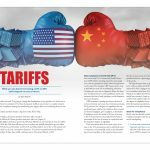 Consider how the tariffs will impact your products and your supply chain as a whole. Not all of these ideas or options will fit or resonate with you or your business. The most important thing you can do right now is discuss the issues with an attorney or expert in customs compliance and learn which elements might be the most useful for you.